Wednesday night’s summer season opener for the Boston Landmarks Orchestra was called “Rhapsody in Green,” and although the DCR Hatch Shell lawn was somewhat brown and scattered with faded Fourth of July confetti, and a security checkpoint and perimeter fence provided an ironic backdrop for an orchestra dedicated to “eliminating barriers to access,” the show nevertheless offered some good performances and a look at an organization trying to find a civic role for classical music in the 21st century. The group’s ethos, however, is surprisingly old fashioned—perhaps even nostalgic—as if it is trying to recapture a time when American families from every walk of life spent their summers in the park listening to music from the town bandstand. The Landmarks’s repertoire includes pieces of Americana and light fare alongside a few great works of the 19th century. For this opening night, Beethoven’s Pastorale Symphony was balanced by a Johann Strauss, Jr. waltz, Vaughan Williams’s The Lark Ascending, and a new arrangement of “At the River” by Anthony De Ritis, the chair of the music department at Northeastern University. This hymn setting worked well as an invocation in the same vein as the famous versions by Aaron Copland and Charles Ives. It didn’t, however, follow through on the promise of an original angle on the old tune. 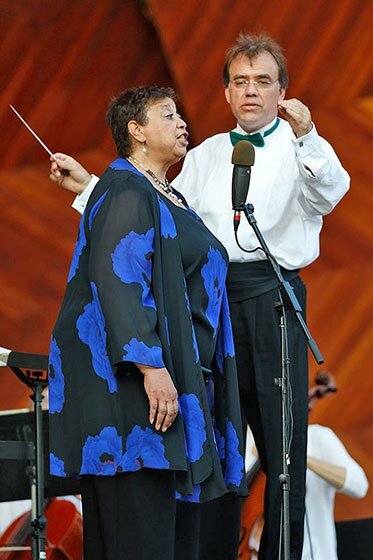 De Ritis’s orchestral introduction seemed fractured and staggered in an interesting way, but when mezzo-soprano Myran Parker-Brass sang in a close-miked ballpark anthem style, the rest of the arrangement became more commonly grandiose. This was followed by The Lark Ascending, featuring Landmarks’s concertmaster Gregory Vitale as the violin soloist. The piece, which can be sugary sweet, was treated more ethereally to good effect by both the soloist and the orchestra. It was also an excellent choice of programming for lawn listening. Strauss’s Tales from the Vienna Woods, however, was received by the audience more as background music to accompany picnicking, hushed conversation, and occasional waltzing. Clearly there is an intuitive grasp that some music should be listened to in relative silence while other pieces don’t require such close attention. At this point we were also introduced to “the maestro zone” — a corner of the lawn where concertgoers were invited to conduct along with plastic drinking straws. This proved popular with kids under eight and with adults whose gestures suggested blood alcohol above point zero eight. After intermission, conductor Christopher Wilkins returned to the podium for Beethoven’s Symphony No. 6, “Pastorale.” The first movement seemed both rushed and sluggish at different points and the amplification resulted in some unusual balances and odd tone colors throughout the symphony. For a heatwave outdoor performance, however, it was a commendable effort and the large scale programmatic structure was clearly conveyed; the fourth movement thunderstorm rumbled in just as the sun set and an evening breeze picked up across the Esplanade. After the symphony, Wilkins and the orchestra offered the finale from Beethoven’s Creatures of Prometheus as a welcome encore. 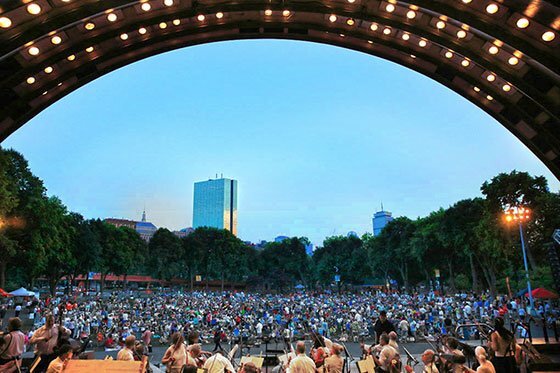 As a civic event, this free concert was basically successful: the lawn was full, a few local notables including WGBH’s Ray Brown made remarks, and the music was enjoyable. But still, for an organization with a social mission, the Landmarks Orchestra plays it safe when there are pressing public concerns they could address through music. For instance, on a planet facing environmental catastrophe it seems quaint, even naïve, to use a “green concert” to celebrate “our city, state and national parks.” And when a board member assures us we will soon grow used to a police checkpoint to hear a concert in a public park, we should consider what kind of music will resonate in a society where that is the norm.